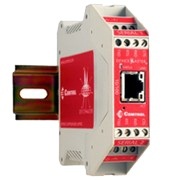 The DeviceMaster UP 2 Port 1E Modbus is an industrial Ethernet Gateway designed to provide connectivity between a vast array of Modbus controllers and devices. This gateway is quickly to setup and easy to be used even with complex Modbus installation as it has a simplified configuration pages innovative functionality and informative diagnostic information. • ESD Surge ProtectionMinimum 25KV for all serial lines. All ethernet components are rated to 1.5KV magnetic surge protection.